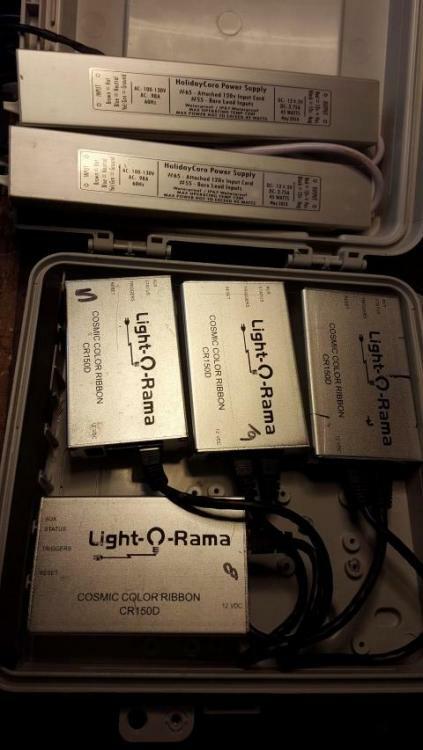 I have 4 ccr controllers with cat-5 patch cords, a weatherproof case (cableguard 1000) and two weather proof power supplies (3.75 amps each) that I'm ready to sell.The strips I used (not included) were cut down to 30 pixels each for my arch size and these power supplies powered all 4 without a hiccup. Full length CCRs may require more juice. I cut the mounting tabs off the controllers so they would fit in the case. Supply your own ribbons, and you're good to go. $125 (includes shipping to the lower 48) gets you the whole lot. You can email me at mgg@pacbell.net. The controllers are for four wire smart pixels. LOR uses LPD6803 pixels with these controllers. Like Mr P said, you don't have to use the LOR pixels with them. Just make sure they are the right type. Be prepared for generic LPD6803 ribbons to have the colors wired differently than LOR's CCR ribbons. You'll need to work around that to get your colors right. LPD6803 CCR ribbons are wired in the traditional RGB order. Generics will almost always be different. I got some replacement 6803 ribbons a couple years ago and they were in RBG order. That's true. I went through that myself. Tedious but simple. In a nutshell, you need to select each pixel in your config and change the circuit numbers so the color order is correct. So, with these controllers assuming 50 pixels each, you would have to do this 200 times (told ya it was tedious). However once your config file is saved, you never have to do it again. Doesn't matter anyway, they sold on ebay.